The amount of food you eat directly determines the results of your exercise. If you exercise 3 hours a day, 7 days a week, but do not eat fewer calories than you expend, you will not lose fat. You will have failed to achieve a Caloric Deficit. If your goal is to build muscle, and you don't eat more calories than your body uses, then your body will not build muscle or strength in response to that weight lifting. Whatever your goal is, the amount of calories you eat is the single greatest factor determining the results you see. Think of fitness as a car. If exercise is the gas pedal, food consumption (measured in calories) is the steering wheel. Where do you want to go? Do you want to build muscle? Build strength? Lose fat? Run faster? Caloric consumption is the means by which you will direct your physical activity toward the right results. Your body requires a certain number of calories to perform all its tasks — everything from sleeping to breathing to lifting weights. The total number of calories your body uses every day is called your TDEE (Total Daily Energy Expenditure). You BMR (Basal Metabolic Rate) is what your body would burn in a single day while completely inactive (or, in a coma), at your age, gender, and body fat percentage. If you want to lose fat, you should eat eat 80% of your TDEE (in other words, maintain a 20% Caloric Deficit). If you want to gain muscle or strength, you should eat 110% of your TDEE (in other words, maintain a 10% Caloric Surplus). Below, I will explain how to calculate your TDEE and how exactly to count your calories. Calculate your BMR in the calculator below. Below, the BMR will display as a decimal, which should be interpreted as a comma. So, if your result is 1.900, that means your BMR is 1,900 calories per day. Determine your activity level, and use the math calculator provided below (ugh, I know) to multiple your BMR by your activity level multiplier. For example: My BMR is 2,003, and I exercise 3-5 days per week. So, I enter into the calculator: 2,003 x 1.45. That gives me a TDEE of 2904. You don't need to recalculate your TDEE every day based on whether or not you work out. 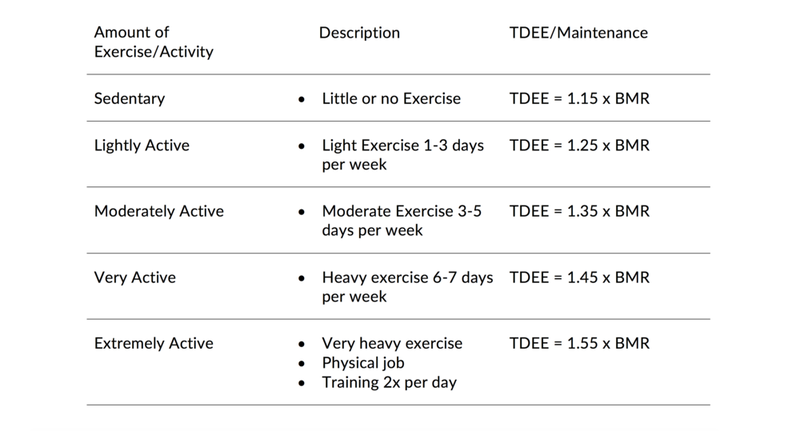 The TDEE is based on averaging your weekly TDEE, which is why the formula is based on how many times per week you work out. One last thing: If your calculated result is 3 digits instead of 4 (for example, it says "206", that means your BMR is 2006. The calculator struggles to display double-00's. Now that you know your TDEE, in order to Bulk or Cut, you have to begin counting calories so that you can ensure you're eating the appropriate amount of calories each day in order to hit your goal. Counting calories is as simple as downloading an app. There are two popular apps — MyPlate (click here) and My Fitness Pal (click here). They are exactly the same. I use MyPlate, but most people I know use My Fitness Pal. You can also make accounts that sync to your phone here: MyPal (Desktop) / My Fitness Pal (Desktop). MyPal is a LiveStrong appl, and My Fitness PAl is an Under Armour product. The only difference, I've heard, is that My Fitness Pal can be a bit "spammy" and keep asking you to upgrade to a paid plan. I've never that experience with MyPlate (for what it's worth). A great journal with a clear layout that allows you to enter all diet information and basic exercise information. For a more exercise-focused journal, I recommend the TheoFit Strong Journal (click here). Record what food you eat and how much throughout the day, and then look it up when you get home. Or, if you're not completely computer-averse, the easier thing to do would be to record your calories in the journal, and then search them in the MyPlate website and enter their caloric values in the evening. If you want to calculate your calories on-the-go, CalorieKing makes this conveniently small book. Yeah but HOw do I count my calories? Right. Sorry about that. Got caught up in the tools. When it comes to using the app, it's very intuitive. The value of the app is that the calorie amounts are all loaded into the app — you don't need to look up any calorie information. It does all the calculations for you. I've coached tons of people who work really hard in the gym for a month, and then ask me why they're not losing any fat. My first guess is always: "You overestimated your TDEE, so you probably think you're in a 20% Caloric Deficit, but you're not." So I tell them to knock off 200 calories per day, and the fat melts off the following month. When you're calculating your TDEE and counting your calories, you'll be tempted to fudge the numbers. The problem is, unlike white collar crime, no one gets away with cheating on their caloric calculations. The results always tell the truth. So, it's better to underestimate your TDEE (if the calculator gives you 2,650, round down to 2,600), and overestimate your calories (if the calorie tracker says 1 tab of butter is 90 calories, enter it as 100). Think of it this way: It only takes you "under-estimating" 5 foods to completely destroy your deficit. That little "treat" that you popped when no one was looking — yeah, it evicerated your fat loss gains for the day. The only way to lose fat is by creating daily deficits that only amount to 500-1,000 calories per day. A single pound of fat is 3,500 calories. So, best case scenario, with these easily sabatoged and small deficits, you're losing 1-2 pounds of fat per week. With a little sneakiness each day, you could spend hundreds of hours in the gym, and tons of effort "dieting," but never see any fat loss. Hold the line on your deficit. Be unforgiving with your numbers. Underestimate your TDEE, and overestimate the caloric value of the foods you eat — and enter everything.